You could have heard it somewhere across a forum..
Or maybe across a top medical website..
That coconut oil is one of the best natural remedies for tonsil stones. It is a natural killer of bacteria. And also it can even stop tonsil stones bad breath. So, does coconut oil for tonsil stones really work? Do practices like oil pulling, gargling really help get rid of your tonsil stones bad breath? What is the actual truth? Tonsil stones are those calcium formed rocks that are formed in one’s throat near the tonsils. Though there are a number of reasons for the formation of tonsil stones, the process of formation is almost the same. The bacteria, mucus, dead cells, food particles, etc form into a debris, which upon hardening forms a hard yellowish thing which we call the tonsillolith. So what does the coconut oil do with these hard formed rocks on your tonsils..? Coconut oil is one of the natural oils that is known to have huge health benefits. The coconut oil is known for its anti-bacterial, anti-inflammatory, and antiseptic properties. This is the reason why it has become a popular remedy for bad breath and also the tonsil stones. See “I am getting these stones again and again” What should I do? Do you know, the core reason for bad breath is the accumulation of bacteria in your mouth? Yes, bad bacteria consists of the sulfur-containing compounds which upon accumulation, gives a stale smell from the mouth. Thus killing the bad bacteria is the surest way of stopping one’s bad breath. On the other hand, a matter of fact is that 50% of the coconut oil consists of good saturated fatty acid called the lauric acid. This lauric acid is what breakdowns into monolaurin that strongly kills the bacteria present in your mouth. Most of the coconut oils are thick in nature. Thus swishing such thick coconut oil softens your tonsil stones and sometimes make them come out of the deep crypts. In simple, the coconut oil is loosening your deep stuck tonsil stones, thus indirectly helping you eliminate your tonsil stones. 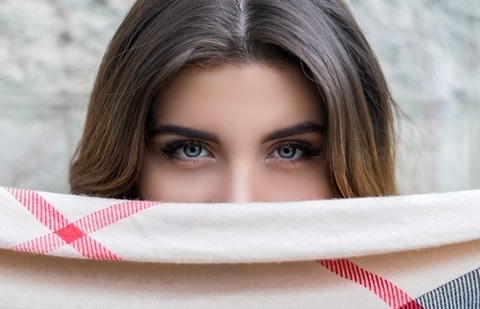 See How to get rid of my tonsil stones Quickly tonight? Although tonsil stones do not always cause inflammation, if caused it can deeply damage your tonsil tissues causing blood and pus to come out. As I said, coconut oil mainly consists of lauric acid. This lauric acid, in addition to antibacterial properties also gives strong anti-inflammatory properties to the coconut oil. If not why do you think coconut oil is applied to many inflamed skin rashes? Thus using coconut oil helps reduce the inflammation caused by your tonsil stones. 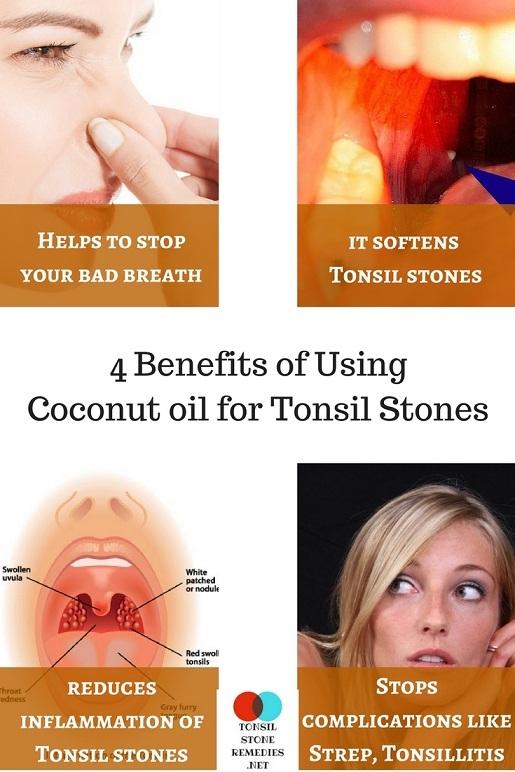 This is another biggest benefits of using coconut oil for tonsil stones. In my book “Tonsil stones eliminator“, I mentioned that one of the biggest problems with tonsil stones is that it holds the bacteria in large amounts. Thus the tonsil stones bacteria at times can cause a number of throat problems like a sore throat. strep throat and even tonsillitis. Thus by using coconut oil you are not only killing the tonsil stones bacteria but also a number of throat problems caused by these stones. So Practically, Does coconut oil really eliminate Tonsil stones? Now, Let me be frank.. I am not that person, who just bombards with all the benefits and tell you that all the remedies will work great… which is no way practical to real life. Many websites, across the internet give out the same bookish remedies which doesn’t work to real people. Unlike them, I at tonsilstoneremedies.net am giving complete research-backed solutions from almost 7 Years. Thus you will not find this practical content anywhere else across the internet. Now, coming to the point.. Yes, this is the truth. Although I agree that coconut oil can loosen your tonsil stones, they may not eliminate them completely. Contrary, if you feel that your tonsil stones are too small and can be easily removed, then you can give coconut oil a try. So, in simple, if this is the first time you got a tonsil stone, or if you found that your tonsil stone is so small (and can be easily removed), then you can use coconut oil for tonsil stones. Then what about Tonsil stones bad breath? Although I can say that coconut oil is not The Best cure for tonsil stones, it is at its best when coming to tonsil stones bad breath. I have personally seen many people, who shared their results, how using coconut oil helped them control their tonsil stones bad breath. This is mainly because of the lauric acid present in the coconut oil which has strong antibacterial properties and thus can kill the bad breath bacteria very effectively. 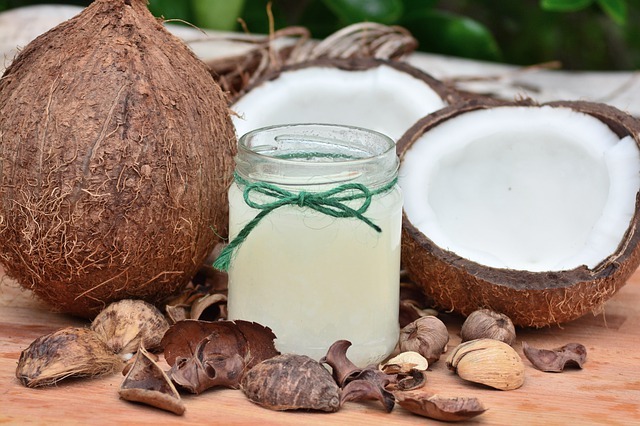 One of the best ways to get the benefits of coconut oil is by doing the oil pulling. Oil pulling is nothing but the continuous swishing of the coconut oil in one’s mouth. Thus such continuous swishing kills all the bacteria and toxins present near your throat and tonsils. So, All you need to do is..
Take 1 or 2 spoons of coconut oil, tilt your head up and swish it as much as possible. Continue this for at least 15 minutes, spit the oil out and gargle with warm water. Remember you need to do this coconut oil pulling every day in the morning and also make sure that the oil is fully touching your tonsils and throat. See Should I Get my Tonsils removed? Is it the best way out for tonsilloliths? This is another easy way to use coconut oil for tonsil stones. For this, you need to take a toothbrush, dip it in the coconut oil and gently apply it on your tonsils. Once you have applied the coconut oil, leave your mouth without washing for a few minutes. After some time, you can gargle and spit everything out. Although this method may not help your bad breath it can strongly help loosen your hard tonsil stones. Though this has a lesser impact, many people do consider edible coconut oil for treating tonsil stones. 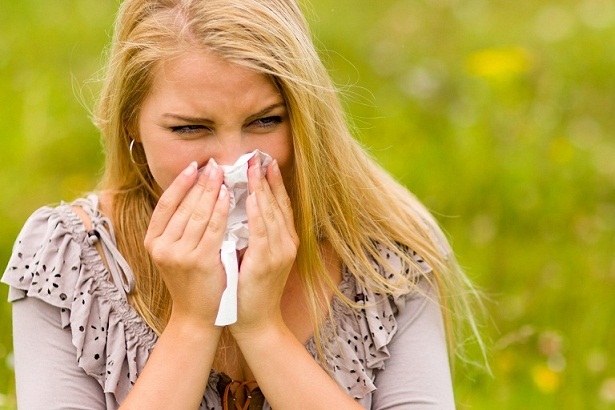 This can help boost your immune system and indirectly fight the problem causing your tonsil stones. All you need to do is eat a tablespoon of pure coconut oil around 2-3 times a day. You can consider adding it in other foods too. Yes, using coconut oil gradually reduces your tonsil stones bad breath. But Just by using coconut oil and reducing your bad breath will have no effect on those yellowish irregular objects on your tonsil. Within few weeks, these Tonsil stones will develop, again and again, causing a series of spine-chilling symptoms like tonsil swelling, infections, ear pains and many many more.. If you want to naturally wipe-out your tonsil stones completely within few days. If you want to permanently liberate yourself from these bad breath, tonsil stones etc and everything. Watch the Spellbinding CASE STUDY that guides you how to permanently eliminate your tonsil stones naturally and completely..